Did you know that Voodoo Dolls can be used for love, healing, and energetic support - they aren't only used to torture enemies and ex lovers! One vital thing to remember when working with any sort of magic is that what you put out into the Universe will likely return to you - often threefold. That rule includes both good AND bad spells. So, remember to try to project as much love into the world as you can - instead of using magic for revenge or to cause pain or loss. In that spirit, I will only post about how to use Voodoo dolls for good and in a way that doesn't go against the tenents of Voodoo, like attempting to control others. As much of the Voodoo religion, Voodoo dolls have been somewhat misrepresented in films and media. Usually, you see a jilted lover using a voodoo doll to exact revenge on her ex or the new lover, poking a doll with pins to cause random aches and pains, contorting the doll to break bones, etc. While poppets (dolls created to represent people and to work magic on them) can be used for torture, pain, and revenge, they can also be used to do things like bring a lover to your bed, to heal aches and pains, to bring money or knowledge, and all sorts of GOOD, positive outcomes. When making a Voodoo doll, it is a good idea to focus all of your attention on creating the doll to represent a particular person. Make sure that you picture that person in your mind as you gather the items you will be using for your Voodoo doll and when you sew the doll together. You can personalize the look of the doll by giving it the same hair, eye, and skin color of the person you are creating it to work with. You can even get a cloth picture of the person printed and make a doll from that picture. It is also good to get something that belongs to the person to stuff into the doll - either a lock of hair or cut finger nails - or even an article of clothing or jewelry that belongs to the person you would like to use the Voodoo doll for. If you don't have the time or inclination to make a photo printout of the person being represented by your Voodoo doll, you can use natural materials to make a stand in. Muslin cloth, cotton, even twigs can be used to create a voodoo doll. Prior to working with your Voodoo doll, you can use sage smoke or a clear quartz crystal to clear the energy of the doll and also to set the intention of the work that you will be doing with the doll. If you would like to bring more love into the person's life, you can use sweet incense like honey or cherry to set the energy of the Voodoo doll. For increased intellect or wisdom, use rosemary. If your intention is to help a person calm down, then use lavendar. To gain wisdom or deepen meditations, use sandalwood or frankincense. If you can, find pins that have different colored heads to work with. Use the pins in the areas associated with what you would like to bring into the person's life. If you would like to use a Voodoo doll to heal yourself, follow the cleansing and meditation steps described above. Use white pins in the areas you are having difficulty in. If you feel that some of your issues are caused by negative energy, place black-headed pins in the areas you feel are being affected by negative energy being directed at you. 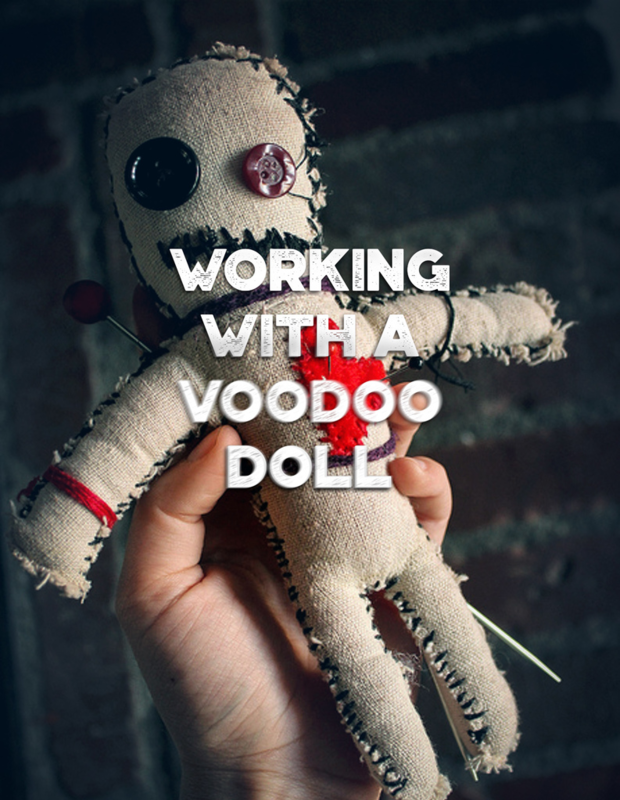 Make a Voodoo doll that represents your ideal partner. It is best if you leave the specifics of who that person is up to the Universe, so you aren't using magic to control another person. Instead of using items specific to one person, create the doll with the intention of having it represent your future spouse or partner. Put a red and a blue pin in the heart area of the doll and then lay the doll in bed with you, on the pillow next to you. Make sure that you burn sweet incense while you are working on this ritual. Talk to the doll as you would to your partner, and sleep with it in your bed every night. Doing this ritual should help to attract a love into your life within 40 days. Would you like to get help with calling on the proper spirits to help you work with your Voodoo doll? Talk to The Divine Prince Ty Emmecca, an authentic Voodoo Priest. 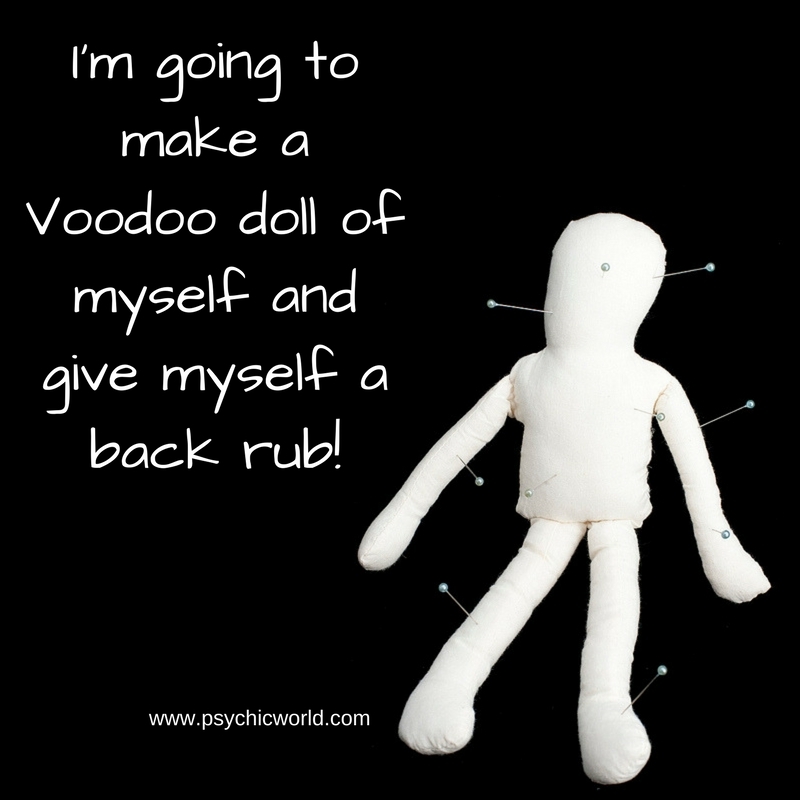 He can help you make and work with your own Voodoo doll. black and white voodoo doll image from CreepyHalloweenImages at flickr.